Is it Time to Redesign Your Nameplate? Are you considering a change in your product branding? Maybe you're not sure if this is the right time to make a change. Chances are if you are asking if it is time for a change that it is at least worth the effort to look at options and considerations. Here are 5 bite-sized tips to help determine if now is the right time to update your nameplate or label. Your logo has changed. When your corporate logo has received a facelift it is important to carry that over onto your product branding for a clean transition. Your company has merged. In the same sense as a logo update, if your company has merged with another the new brand should be reflected across all product lines. Your competition has updated their product branding. Staying aware of how your product and brand compare to others in the market is a key part of any brand strategy. Look at how your message is delivered when standing next to your competition. Your product has matured. Consider a refresh to update or enhance your brand awareness in order to stay current. An updated look can elevate and re-energize your brand. Your product line has expanded. Carry the look of your product identification across multiple models for a unified brand awareness. No matter if the change for your nameplate or label is simply a revision to color or review for completely new tooling, be assured that you can trust your brand with us. We can help guide you through the design process answering any questions you have in each of the areas. Engineers, designers and customer service groups work together to support your needs in nameplate redesign that represents your good name. 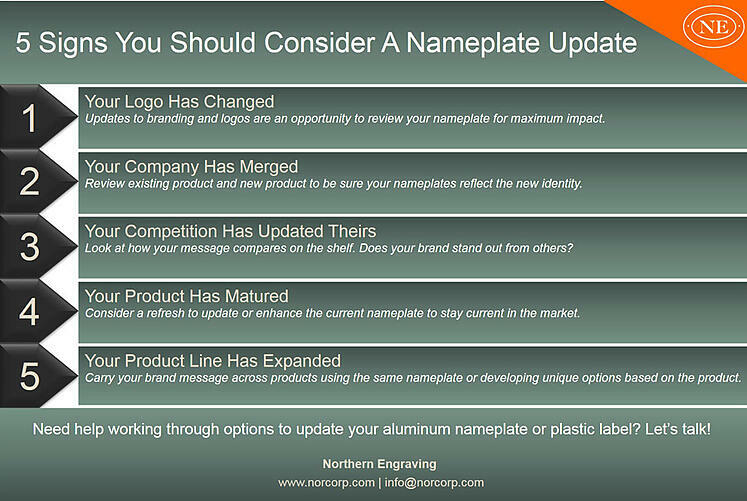 Need help working through options to update your aluminum nameplate or plastic label? Let's talk! Editor's Note - this article first appeared in our Nameplate Blog in December 2015. We have updated for current best practices and tips for your resource. Enjoy!